← Why give away fish flows for free during a drought? California is in one of the most severe droughts in recent years. This means water agencies are under great pressure to sacrifice river flows meant to sustain fish and wildlife for increased water delivery to farms and cities. Here are some questions decision-makers should consider in the tradeoff. The answer lies in a value judgment: how important is it to save species and ecosystems special to California? 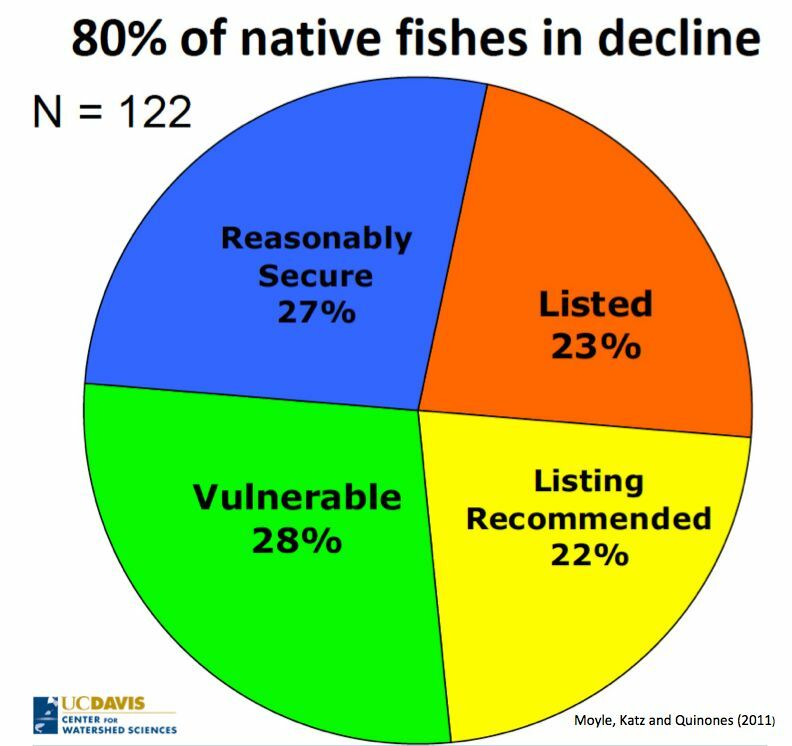 Today, 82 percent of California’s 122 native freshwater fishes are found only or mainly in this state. Without these uniquely Californian species, our streams and lakes would have the same carp, bass, sunfish and other homogenized fauna found in much of North America. 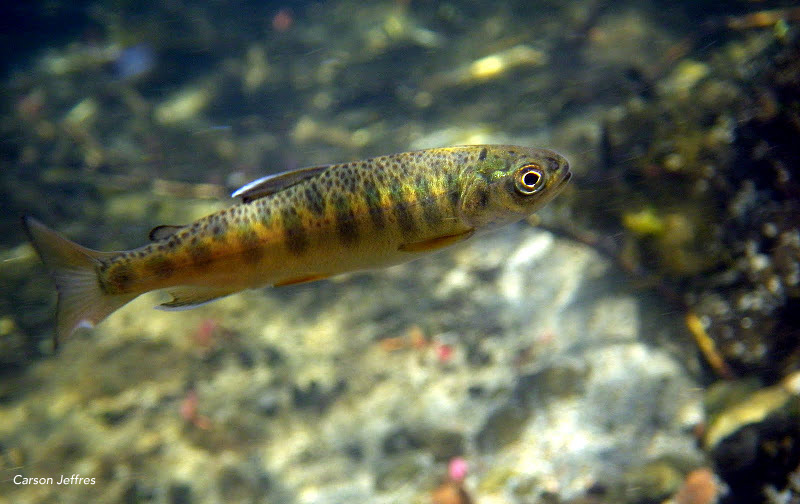 Our California populations of steelhead trout and Chinook salmon are uniquely adapted for local conditions. If spring- and winter-run Chinook were to disappear from the Central Valley, we could not replace them with salmon from Alaska. They simply could not survive here. Even without drought, most of our native fishes are in trouble. More than 80 percent of them are headed for extinction by 2100 if present trends continue (Moyle et al. 2012). This includes most of our 32 kinds of native salmon and trout (Katz et al. 2013). Our federal and state endangered species laws essentially say it is the policy of the United States and California to not let species go extinct. The current drought will put this policy to a severe test. How capable are our native fish of surviving severe drought? Yes, California salmon and other native fishes have survived much worse droughts. Their evolution has been shaped by the state’s isolation and Mediterranean climate, which has meant persisting through extraordinarily long dry spells. The fishes have adaptations that reflect this history. Chinook salmon in the Central Valley, for example, have four runs that are each keyed to a different season and habitat but overlapping in both. Adults can return from the ocean at 2 to 6 years of age. Juveniles can head to sea at various ages — lingering in rivers and the Sacramento-San Joaquin Delta or making a beeline for the Pacific in a few days. They also can take refuge in the constant, cold flows of spring-fed streams or take advantage of ephemeral flows from rain and snowmelt. But water development has largely robbed the salmon of their ability to use this amazing adaptive resiliency. Dams have blocked more than 1,000 miles of critical cold-water refuges such as the snowmelt streams feeding the San Joaquin River and the spring-fed McCloud and upper Sacramento rivers near Mount Shasta. The impoundments were particularly devastating to winter- and spring-run Chinook, which depended on high elevation habitats. The Delta and channelized rivers are no longer suitable for young fish to linger and grow. They are now ecological traps full of alien predators. Commercial fishing takes the largest and oldest fish, reducing the ability of a population to outlive drought conditions. Meanwhile, hatcheries are simplifying life histories, changing behaviors and otherwise diluting wild stock. As a result, entire populations can become maladapted to natural conditions, inhibiting recovery (Katz and Moyle, 2012). What can we do to ensure native salmon persist through severe drought? Emergency trucking: Fishery agencies may be hauling adult winter-run Chinook to the cooler McCloud River this winter if it appears that Shasta Reservoir will run out cold water in the summer. This would be a rescue measure of last resort as the odds are stacked against adult salmon surviving the transport, let alone spawning a brood for capture and return to the Sacramento River. Alternately, winter-run juveniles could be reared in the spring-fed Mount Shasta Trout Hatchery. More policing: Stepping up warden patrols of key salmon streams such as Deer and Mill creeks in Tehama County to prevent poaching of spring- run Chinook and illegal water diversion of water such as for pot farms. Fishing bans: Managing ocean salmon fisheries to allow more fish to grow to larger and older. Spring relief: Finding ways to maximize cold-water flows from springs to benefit fish. For example, Shasta Valley farmers could be paid to reduce water use, resulting in less runoff of warm irrigation drainage into the cold, spring-fed Shasta River. Triage panel: Convening a panel of state and federal fishery scientists with authority to decide which species are in greatest need of the “environmental flows” reserved for imperiled fishes. Should this water, say in Oroville and Shasta reservoirs, be released to benefit winter- and spring-run Chinook salmon or delta smelt? 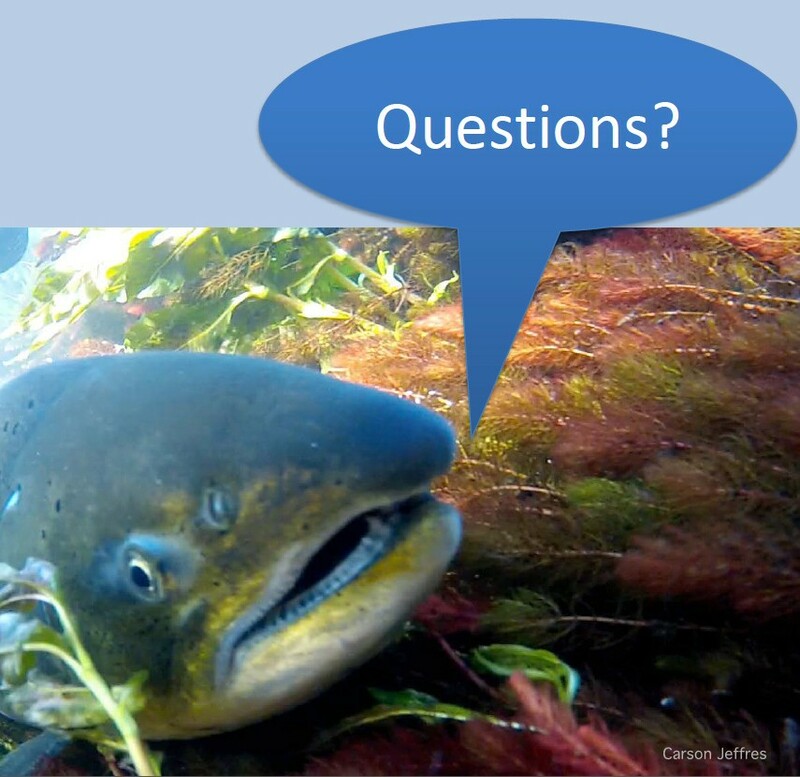 What should be done after the drought to recover salmon and salmon fisheries? Salmon sanctuaries: Stretches of rivers and streams or watersheds dedicated to salmon conservation. First proposed by Livingston Stone in 1872, in response to mining and logging destruction of California rivers, the idea has received wide acceptance as a reasonable conservation step – but little traction in California. One exception is Blue Creek, a tributary to the Klamath River. Thanks to the Western Rivers Conservancy, the Yurok Tribe is acquiring land along the creek to continue managing it as a salmon sanctuary. Other obvious candidates are: Shasta and Smith rivers and Battle, Deer and Mill creeks. Reoperation of dams: Identifying how operators can economically manage the timing, volume and temperature of flows beneficial for salmon and other fish. 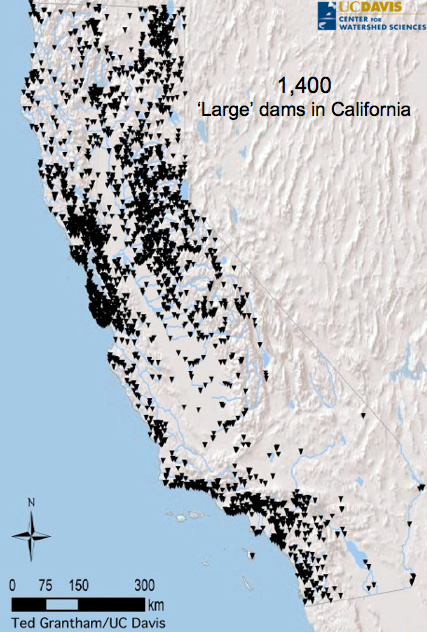 Many of the more than 1,400 large dams on California rivers fall short of providing adequate flows for fish. California explicitly requires dam owners to release enough flow to keep fish “in good condition” (Fish and Game Code, Section 5937). Stricter rules apply on waterways important to threatened and endangered species. Removal of dams: Sediment has filled the reservoirs of many small dams in California, making them useless. Accelerated and selective removal of dams below suitable habitat could significantly increase the likelihood of salmon and steelhead persistence. 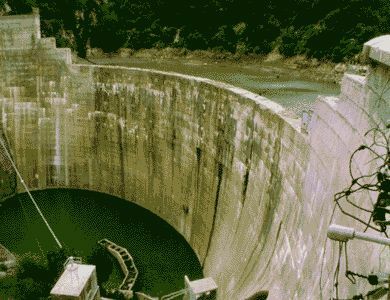 One prime candidate for removal is Matilija Dam on the Ventura River. Re-operation of fish hatcheries: They should be managed to favor wild salmon. Numerous studies have found that the planting hatchery salmonids has impaired the health and resilience of wild populations. Yet hatcheries in California continue to pursue the goal of both supporting commercial and sport fisheries and supporting recovery of wild populations. They generally fail at the latter, often damaging wild populations instead of helping them (Katz and Moyle, 2012). The dual mission results in publicly funded fish hatcheries undermining publicly funded wild fish recovery efforts, a problem exacerbated during drought. Such a strategy can work only if well funded. Saving our native fishes will require considerable water and effort from Californians. While this may seem too much to ask during a severe drought, California history shows that water crises are a great motivator (Lund, 2014). The timing for instigating a statewide fish conservation strategy couldn’t be better. Peter Moyle is associate director of the Center for Watershed Sciences and a professor of fish biology who has been documenting the biology and status of California fish for 42 years. Lichatowich, James A. 1999. Salmon without rivers: a history of the Pacific salmon crisis. Island Press, Washington, D.C. This entry was posted in Uncategorized and tagged drought, native fish, Peter Moyle, salmon. Bookmark the permalink. Acknowledging the mismanagement of California’s northern California water supplies and the addiction of southern California to NorCal’s water is a critical first step in diagnosing the disease that we are dealing with. Without dams we would have no water supply for this summer. Dams also hold clear and cold water crucial for the maintenance of healthy salmon and trout. Prior to the dams, river flows may have ceased almost entirely during California’s droughts. California’s prior two years produced 86% of the average precipitation, which would hardly be considered drought conditions by anyone with an ounce of sanity. The problem is the mismanagement of water flows to SoCal. This past year alone, an actual drought year, the Bureau of Reclamation and DWR have conspired to pump an additional 850,000 acre feet of water over the Tehachipis taking our storage down to unsafe levels. The fact that DWR has over allocated water rights to approximately 180% of average flows is simply irresponsible and promotes problems. The fact that desert and lands that if previously farmed were dryland farmed are now planted with permanent crops is irresponsible. The UC system’s agricultural advice which has led to contaminated groundwater and overuse of resources is part of the problem. There are many socio-politico problems associated with California’s water. An interdisciplinary approach is needed to provide a best fix. Allowing water agencies, farm lobbyists and lobbyists to make all of the important decisions is a bad prescription for this disease! I notice there is no mention of the current Bay Delta Conservation Plan (BDCP). Might one be able to elaborate of that project’s impact on our native salmon? Or is that a separate article all-together? Small scale local citizen run hatchbox programs can provide a boost for wild salmon populations. Unfortunately, after an initial success, they were abandoned by the California Department of Fish and Game precisely because they were so successful. At that time, the concern was diluting genetic pools. Now, with fish numbers precariously close to extirpation, it is time to re-invigorate citizen-run small scale hatchbox rearing. There are citizen groups with the experience, expertise, and infrastructure to run these programs. The Department needs to give its go-ahead before it becomes too late and the stock populations too feeble. Dr. Moyle, Please bring this to the attention of DFW. Tim, I like your comment above and find it generally accurate, however, ” This past year alone, an actual drought year, the Bureau of Reclamation and DWR have conspired to pump an additional 850,000 acre feet of water over the Tehachipis taking our storage down to unsafe levels.” I have a question here: I don’t question the 850K AF but the “over the Tehachipis” part? I thought most of that was going to water banks in the Southern San Joaquin valley and/or into San Luis reservoir? Where do you find this info about distribution in So, Cal of this pirated water?